Happy 2013! Smartwebpros.com Inc.'s 2013 Initiatives. Happy New Year from everyone at Smartwebpros.com Inc. When a new year begins, a previous year closes, many can’t help but pause and reflect on the previous years events, ups, downs, and challenges. This is a good time to look at how your industry has changed over the year, and how your customers have changed. In a fast emerging, increasingly technological world, consumers are changing not only their buying patterns but their buying behaviour.We've taken a look at what we have been doing to support these changes, and what we can do this year to make our business and community better. We have some new 2013 community initiatives! We’re proud to announce that we are now supporting the Child Life Network with internet and internet marketing services. ChildLife Network International Inc. (CNI) is a registered, non-governmental organization, based out of London, Ontario, Canada and initially founded by Allan Ssemugenyi. Smartwebpros.com Inc. is continuing its sponsorship of the London Silver Dolphins masters swim team. We will continue to help build their social media community. The Dolphins are proudly hosting the 2013 ProvincialChampionships and Smartwebpros.com Inc. is excited to support them in this experience! The new 2013 Provincial Championships website is able to take online registration and online payments from swim competitors, as well as show users with a unique login what events they have signed up for. We wish all competitors the best of luck in their 2013 season and at the 2013 Provincial Championships. We’ve also taken a look at our own services and the industries we serve, and have made a few small changes for 2013. These will be of benefit to both our current and future clients. We also have some more changes in the works that are not quite ready for announcement, but we will write separate blog posts for those as they happen! In light of the new year, a time when businesses adjust their marketing plans and business plans, we’ve added some services to our search engine optimization packages. We understand that industries change, businesses change, and customers change. That’s why we’ve created a new service to allow clients to expand their keyword list outside of their contract. Clients will now be able to add keywords to their SEO packages for $10 a keyword/ month. For clients who have built websites and have hosting with Smartwebpros.com Inc., we can optimize your website for single keywords at $50 a keyword/month. This is a great opportunity to try our search engineoptimization services, and get your website listed on the first page of Google! We pride ourselves in our ability to quickly make text and image changes for clients. We understand that a website is never truly complete, and changes may need to be made in order to reflect your businesses growth or market focus. To be able to fairly allocate our resources to clients with text and image change services, we will be putting a cap on the number of requests we promise to complete in a month. After you have reached 10 requests for text and image changes, we will still make more changes for you as this service is unlimited. Further requests, however, will be put into priority sequence behind those clients who have not reached their maximum text and image changes. You will have 24 hours from the completion of the initial request any edits to the material. We encourage clients to gather their requests for text and image changes into one email so we can maximize the use of our time and get changes online as quickly as possible. We look forward to making more announcements as the year progresses and encourage everyone to reflect on the 2012 year, and how you will make 2013 better for your friends, family, business and the communities that support you! Congratulations to Armour Shield Roofing! On behalf of everyone at Smartwebpros.com Inc. we would like to congratulate one of our clients, Assaad Eldik and Armour Shield Roofing, a roofing company in London Ontario. 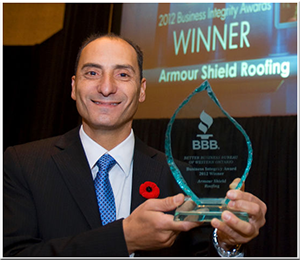 Armour Shield Roofing has been named the 2012 BBB Integrity Award Winner! After being top 3 finalist in 2010, 2011, and 2012, it is with great honor that Assaad has now been named the winner of this prestigious award. Armour Shield Roofing was incorporated in 2002, and distinguishes itself by using top quality products and top quality installation techniques. Assaad wanted to make a difference in the roofing industry in London, Ontario; an industry with far too many "pop-up" companies and inexperienced roofers. He's made that difference by being fair to his customers, giving them the comfort of knowing exactly what the process will be and what products he recommends. In addition, Assaad is committed to making a difference in the community. Armour Shield Roofing supports local sports teams, and charities both financially and by volunteering. Fully qualified and professional roofers, in addition to reputable, quality products, providing the highest levels of customer services, and supporting the community is all part of Armour Shield Roofing's recipe for success. We hope that Assaad's achievements will encourage other small businesses to make an impact on the community that they work in. We know it has at Smartwebpros.com Inc. and we're already brainstorming some exciting new community projects for 2013! We can't wait to let you know what they are. Stay tuned, and once again, congratulations to Assaad and everyone at Armour Shield Roofing!! !